Ascending Butterfly: @yurbuds and @BestBuy want to help you 'Cut the Cords' and #GetMotivated let this @BestBuyWOLF show you how to save! @yurbuds and @BestBuy want to help you 'Cut the Cords' and #GetMotivated let this @BestBuyWOLF show you how to save! Have your fitness resolutions already gone by the wayside? Are you having trouble staying motivated? New York City has been hit by back to back snowstorms and the Polar Vortex was starting to put a cramp in my fitness style, but then I remembered my Wii and my Wii Fitness Board and got back to work! With me because I've done the games so often already I don't really need to 'listen' to the virtual instructor to know what the moves are I just tend to throw on my headphones and iPod and listen to my own playlists to keep me motivated. 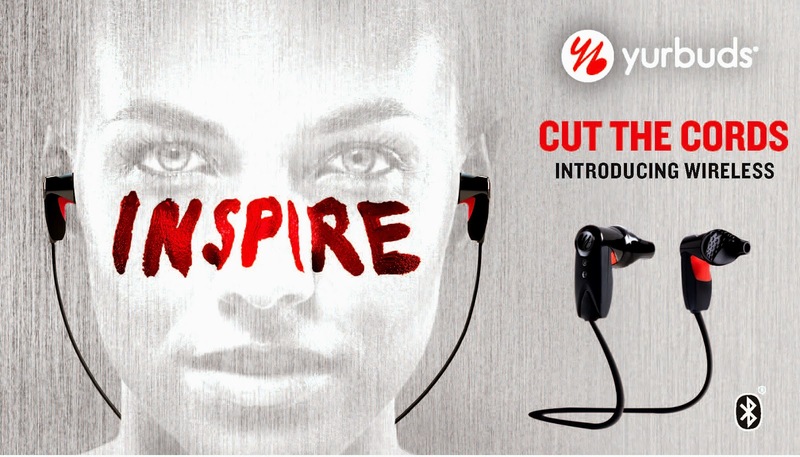 Last year we brought you a giveaway from yurbuds. Which by the way has become the #1 selling sport earphone company! And for good reason, they really do stay put in your ears and don't pop out! I posted a full review in addition to the giveaway HERE (just remember the giveaway component is no longer accepting comments and is closed but you can still read the review to see how they held up to our 'road testing'). I am happy to report that yurbuds found a way to make a good thing even better by cutting the cords! Now there is no tell tale cord connecting to your device, making your jog or power walk just as fun, but keeping the fact you are using a device or a phone a little less obvious. And in the City I live in, it's best to keep your phone or device concealed at all times! Studies have shown that music can increase the intensity as well as the duration of a workout by at least 15%, and you don't have to sell #TheOfficialTwitterPartyDJ on the importance of music. It's always been a passion for me! yurbuds was founded in 2008 by an Ironman Triathlete who is a 24-time marathoner who was sick of earbuds falling out his ears during workouts. They are made for fitness enthusiasts, and they don't slip out so the workout doesn't have to stop! Did you know that BestBuy has the largest selection of yurbuds? Check them out HERE and they even offer a big list of Health & Fitness HERE so you know that means there is literally no excuse to break your fitness resolutions this year! FTC Disclosure: I am a Best Buy Brand Ambassador. This allows me to share information, sales, product reviews and deals on a regular basis! This is a Sponsored Post brought to you by Best Buy and yurbuds. An Affiliate Link is used in this post. All opinions are 100% my own. I am disclosing this in accordance with the Federal Trade Commission 16 CFR, Part 255 - Guides Concerning the use of endorsements and testimonials in advertising, you may visit our full giveaway and disclosure page for complete policy information. I love the yurbuds because you can put them over your ears. For some reason, the ones that go into your ears never fit me because I have tiny ear canals. @Tough Cookie Mommy - It is hard to get a good fit with earbud earphones that's for sure! That's why I love that yurbuds don't fall out! Many people with tiny ear canals usually end up with over the ear headphones because of that. This is great I have trouble keeping the ear buds in my ear after a bit my ear hurts ,these wireless set sound like what the DR ordered. I'd love for you to do review !